When it comes to fine dining, I actually often find it very hard to put the experiences into words. Most of the time, it is impossible to fault the cooking of the food, but I can't help that the higher up the Michelin scale you get, the higher the chance of the food boring you to death. This is partly why I have never got round to writing up mega-restaurants such as Gordon Ramsay or Alain Ducasse at the Dorchester. Both restaurants definitely rolled out course after course of well cooked dishes, with great produce and fantastic service at the core of what it is trying to achieve. Yes they were good, but lacked any wow factor. I had the same concerns prior to a visit at Alyn Williams at the Westbury. I wasn’t worried about the cooking (Alyn is an ex two Michelin starred chef who cooked under Marcus Wareing) nor about the service (Giancarlo Princigalli has been front of house for both Petrus and Marcus Wareing), but where was the excitement going to come from? How was this meal going to differ from any other top end restaurant? Starting with an array of mouthfuls including perfect arancini and a rice cracker topped with prawn, each course contained enough playful elements to keep me interested. 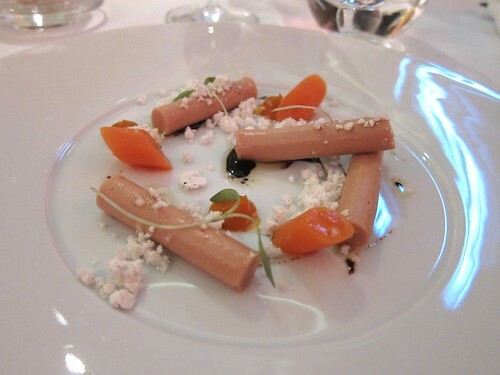 A foie gras set mousse starter with sand carrot was a way of preparing foie gras I had never experienced before, whilst chicken, leeks, spinach and mushrooms was a brave course to put on a menu, using a smoked egg yolk as a sauce. The dessert was the real star turn, offering a deconstructed cream tea. 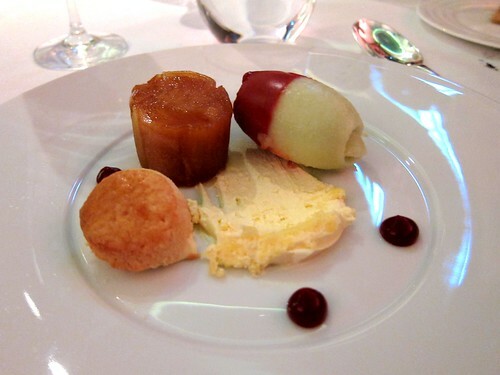 Apple came in a very clever green and red apple sorbet, apple puree and roasted apple. Paired with a mini scone and a clotted cream mousse, this elevated the whole meal to great heights. 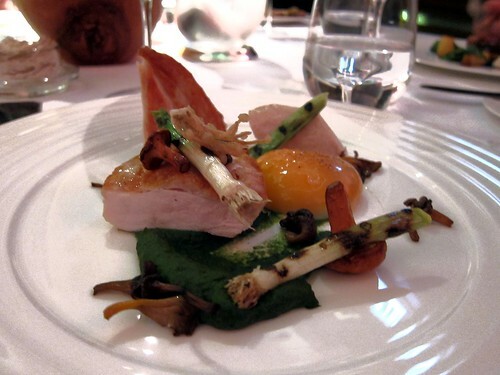 Alyn Williams is a classically trained chef unshackled. The quality of the cooking and traditional French techniques are still evident, but in charge of his own kitchen, he has the ability to go a little more left field and add his own personality to his menu. 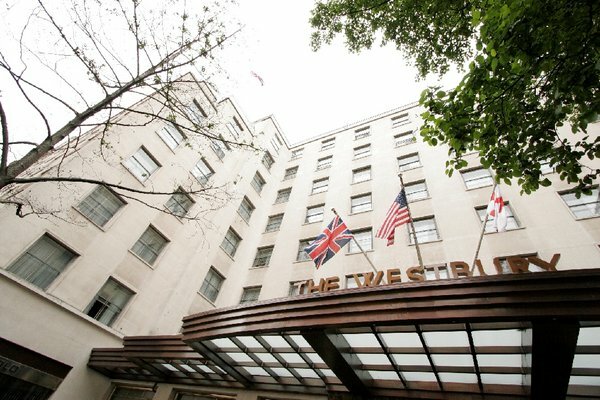 Located in a Mayfair hotel, you need to contend with the horde of tourists and businessmen who are rich enough to stay here, same with the high class prostitutes who solicit the Mayfair hotel bars, but locate the oasis that is Alyn Williams at the Westbury and buckle your tastebuds in. They’re in for a very enjoyable ride. The roasted apple is very clever, isn't it? I had a similar piece on my (rather different) dessert. You don't mention the excellent prices this restaurant offers, something worth noting considering the location and the chef's pedigree. Here is the write-up of my visit.